Upgrading or replacing your vehicle lights? Deciding between incandescent tungsten-halogen bulbs, high-intensity discharge lights (HIDs) and light emitting diodes (LEDs) can be a difficult choice. Each light source has its advantages and disadvantages, let our many years of experience guide you to the light. As time progresses, innovative solutions and improving technology are making them more feasible. HID lamps are much more energy efficient compared to regular incandescent lamps. While they require a substantial amount of power during start-up to create the light, the amount of power required to sustain the light is considerably less compared to regular incandescent lamps. HID lamps are also much more durable with an average working life of 2,000 hours compared to the 500-800 working hours of an incandescent halogen bulb. LED's are very efficient at turning electricity into visible light. They also produce very little heat, are very durable and have a very long working life of over 25,000 to 100,000 hours. The The HID 8500 Series from Vision X brings you an internal 35 Watt ballast producing 3500 lumens of light while drawing only 3 amps while running with an operating time of 2500 hours. The 8500 has been tested and proven as the number one in HID Lighting. Being manufactured from die-cast aluminum, the HID 8500 Series is tough enough for all conditions. The front has the ultimate protection of a borosilicate hardened glass lens, and the starter and ballast are in the light for ease and protection. And with an IP rating of 65, the HID 8500 Series is totally protected from dust and is protected against water splashes. The HID 8500 Series will do everything you need it to, no matter what the weather conditions are. The Vision X HID 8500 Series is the lighting solution for the brightest, longest lasting, and most durable light on the market. 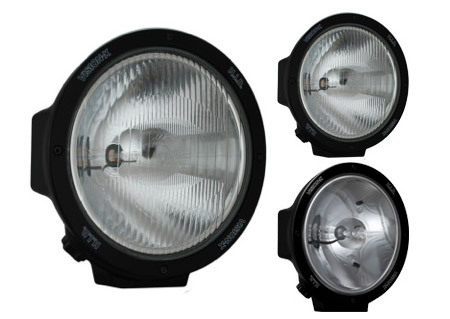 The 8500 Series is available in 3 optic patterns - Euro, Flood, and Spot - as well as in chrome or black housings. It's no wonder Vision X is trusted by US Boarder Patrol, Trophy Truck Racers, NASA, and everywhere in between. 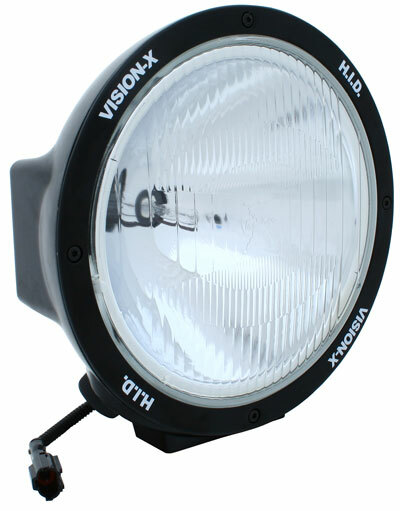 Vision X HID Technology is the future of the HID lighting market. The HID 8500 Series comes with a Deutsch Connector and wiring harness for easy plug and play set up meaning you can spend less time on installation and more time enjoying the high light output. The HID 8500 Series has a DC input range of 9 to 32 volts. Each light in the series comes with a street legal black X cover so when the lights are not in use, they can stay protected.